Today marks the 42nd anniversary of the infamous Supreme Court decision of Roe v. Wade. 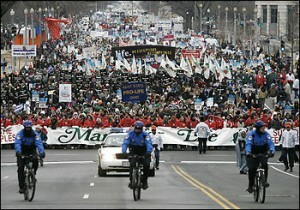 Today, hundreds of thousands will gather in Washington D.C. and pass by the White House and Supreme Court building. Today, this annual event will once again be ignored by virtually all popular media and be viewed as an annoyance by the multitude of residents in the Capitol. In 1973,by a 7-2 margin, the Supreme Court overturned State restrictions on abortion, although allowing for implied restrictions during the latter part of pregnancy, loosely linked to the terms “woman’s health” and “fetal viability.” In subsequent years, even as medical and technology advancements exposed the humanity of the unborn child and improved maternal health, the Court made repeated convoluted rulings not only defending the original decision, but continued to toss aside virtually all restrictions to abortion on demand, for any reason at any time. The sole Catholic Justice, liberal-leaning William Brennan Jr., voted with the majority opinion in Roe. A precedence was set, and it didn’t take long for many Catholic politicians to begin towing the “women’s right to choose” line. But what was to be the landmark event setting the course for the current Catholic politician posturing was the 1984 Notre Dame speech “Religious Belief and Public Morality: A Catholic Governor’s Perspective” made by New York Governor Mario Coumo. While the title seemed innocuous enough, Coumo quickly moved to the heart of the matter – rationalization of abortion rights. An accomplished orator, Coumo justified moral relativism, and culminated in a conclusion that there existed no conflict between his devout Catholicism and his support for abortion rights. His widely-circulated arguments became the anthem of the future generations of pro-abortion Catholic politicians. Mario Coumo passed away January 1 2015, still holding to his position. Invited to respond to the Coumo address, 11 days later Congressman Henry Hyde addressed the same Notre Dame student body. Not given the same importance as the high-profile Coumo, Hyde’s speech location was relegated to the law school basement student lounge. His talk was titled “Keeping God in the Closet: Some Thoughts on the Exorcism of Religious Values from Public Life”. In a masterful, thoughtful and rational dissertation, he proceeded to dissect and lay bare the errors and hypocrisy of Coumo’s stance. Prophetic words, especially in light of the state of our society today. Hyde was a life-long faithful and devout Catholic. More importantly, he was unafraid and unapologetic in bringing his faith into the political realm. May we pray that more Hydes enter the political arena, and fewer Coumos. St. Thomas More, Patron of Statesmen and Politicians, pray for us! Gov. Cuomo’s position that he outlined in 1984 at Notre Dame can be largely attributed to the consultation he received from Rev. Robert Drinan, SJ (D-MA). Fr. Drinan, evidently a Democrat politician by day and Catholic priest by night, was the architect behind creating the moral ambiguity that allowed Sen. Ted Kennedy, Cuomo, and other Catholic Democrats to take the now obligatory stance of being personally pro-life, but unable to enforce their views on others. Today is a sad day, made all the more sad by the fact that elements of the Catholic clergy created the framework to allow great evil to exist unchecked.